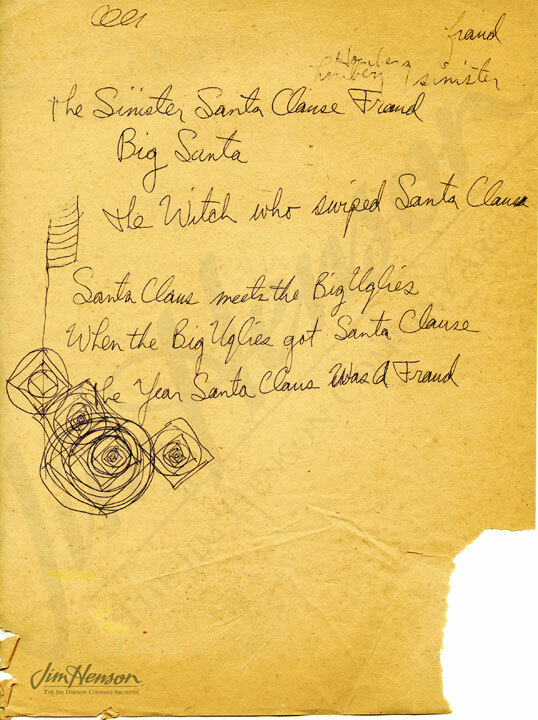 In 1963, Jim Henson and Jerry Juhl came up with an idea for a Christmas special originally titled The Witch Who Stole Santa Claus or The Sinister Santa Claus Switch. 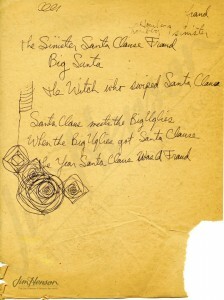 The story revolved around a failed plot to kidnap and impersonate Santa Claus in order to rob every home in the world. Taminella Grinderfall, the witch from the unsold Tales of The Tinkerdee pilot was to play a starring role. The villains, working for a wizard named Cosmo alongside his giant henchmen Thig and Thog, were bird-like creatures called Frackles. The heroes, working for Santa, were elves. They, of course, saved the day. Jim and Jerry reworked the script numerous times, and the title changed as well. 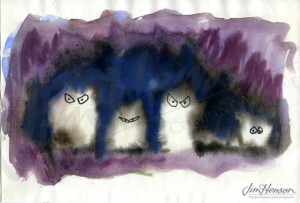 In order to sell the idea to television executives, Jim created watercolor illustrations to accompany a written proposal. He circulated the concept for several years before Ed Sullivan, on the strength of the Muppets’ frequent appearances on The Ed Sullivan Show, agreed to produce the hour-long musical special and air it in his regular Sunday evening time slot on December 20, 1970. 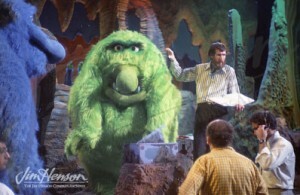 The final script was written by Jerry Juhl, and it featured music by Joe Raposo, the first musical director of Sesame Street. 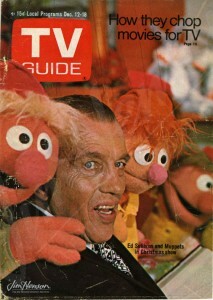 Ed Sullivan served as narrator, and the cast, a combination of live roles and Muppets, included Art Carney. 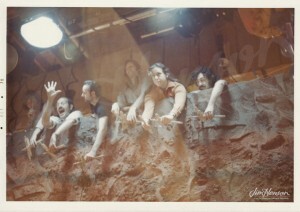 To cast such a big production, Jim had to go outside his small group of puppeteers for the first time. He was delighted to discover the talents of Richard Hunt, a young man who would become an integral part of Jim’s team. After performing background characters in The Great Santa Claus Switch and The Frog Prince, Richard was hired for Sesame Street in 1972. He went on to perform major characters on The Muppet Show and Fraggle Rock including Scooter, Statler, Beaker, and Junior Gorg. Fran Brill, Sesame Street’s Prairie Dawn and Zoe (and first female puppeteer), also started with Jim on The Great Santa Claus Switch. Jim’s list of possible titles for The Great Santa Claus Switch, 1963. Rough watercolor concept by Jim for a 1967 pitch for The Great Santa Claus Switch. Jim directing Thig on set of The Great Santa Claus Switch, 1970. (From l to r) John Lovelady, Frank Oz, Jerry Nelson, Danny Seagren, Caroly Wilcox, and Don Sahlin performing marionettes for The Great Santa Claus Switch, 1970. 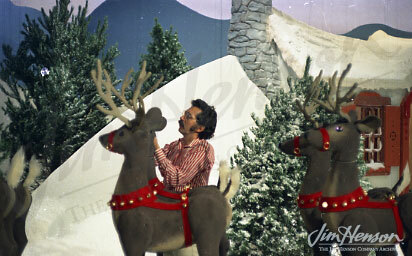 Don Sahlin arranging reindeer on the set of The Great Santa Claus Switch, 1970. Ed Sullivan and elves on the cover of TV Guide, December 12-18, 1970. This entry was posted in 12-December '70, 1970, Great Santa Claus Switch and tagged Brill, Carney, Christmas, Hunt, Juhl, Raposo, Sullivan, Thig, Thog, Tinkerdee. Bookmark the permalink.